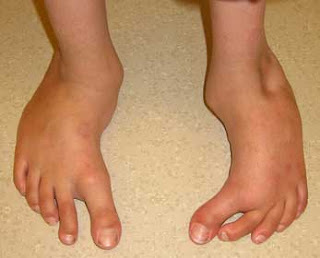 It is a defect of foot by birth, in which the upper part of foot having fingers turns towards inner side (sideways). This condition is seen in newborns by birth. This condition is also known as metatarsus varus and forefoot varus. This condition of foot may be flexible i.e. can be aligned with hand or non-flexible i.e. cannot be aligned with the help of hand. The infants born with metatarsus adductus are more susceptible to hip dysplasia. The ratio of occurrence is 1 in every 1000 to 2000 births. This condition is treatable and is considered non-fatal but sometimes, this condition recovers itself by its own. Only moderate to severe condition of metatarsus adductus are treated. The foot appears to be bent towards inner side sideways. Some children may have this condition on both foot. This condition may occur due to the breech position of baby in mother’s womb and can also occur if mother is suffering from oligohydramnios. A family history with metatarsus adductus is also the cause of this condition. Physical examination is done to diagnose such disorder. Treatment options depends upon the rigidity of foot. Stretching exercises of foot and wearing special shoes are included in treatment. Stretching exercises are done if movement of foot is easy. These stretching exercises should be done by professionals not by parents but if there is mild metatarsus adduction then parents can do it. Serial stretching is required for proper recovery of metatarsus adductus. These exercises include movement of foot during the changing of diaper and how to adjust the sleep positions of baby mostly side way lying is recommended by physicians. It is very rare that the baby do not respond to the stretching exercises and then long leg casts are applied to treat metatarsus adductus. If the foot do not recover from exercises, then the child have to wear some special or splint shoes known as reverse last shoes. These shoes have to wear by children for most of the time in a day so that the foot can align be on its correct position. Sometimes, children have to wear cast on foot and leg. Wearing Cast is more effective if the child wear it before 8 months of birth. But the main drawback associated with cast is that it has to change after every 1 to 2 week of time. 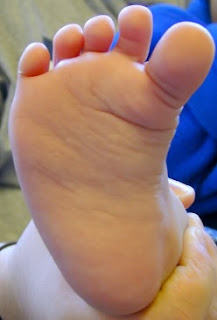 Clubfoot is a different condition from metatarsus adductus as in metatarsus adductus the upper side of foot bend towards inner side sideways but in clubfoot the upper part of foot containing fingers bend downward to the inner side facing other foot and the ankle is also turned inside. Metatarsus is less complicated and requires no or easy treatment as compare to clubfoot. The foot may remain small in size in clubfoot but in metatarsus adductus this do not happens. Clubfoot syndrome may lead to a condition known as rocker bottom but metatarsus adductus lead to dysplasia of hip.